I've eaten lots of Quinoa dishes but have never actually made it from scratch as a plain side like rice, so I went to the Internet to find out how to cook this protein packed grain. I found all kinds of variations, and most said, "you cook it much like rice." However, being an American raised Asian, I normally cook rice in rice cookers and not on pots on top of the stove. As well, when I have cooked rice on a stovetop, I never bring it to a boil then lower to a simmer which many of the Quinoa how-tos called for. I do a slow simmer of my rice for 30 minutes. I had to giggle a bit because it's definitely a cultural difference. So, I experimented, and this is what produced for me the best fluffy Quinoa. To note first, 1 cup of dry Quinoa which will produce about 3 cups cooked. 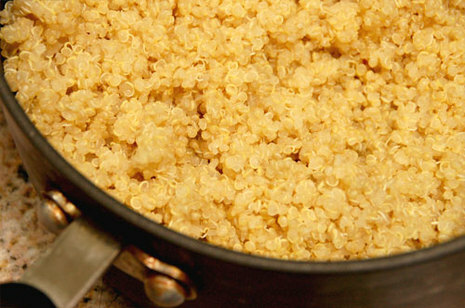 Pour the dry Quinoa into a medium size sauce pan that will hold at least 4 cups. Don't want any over flow. Rinse the Quinoa. Now, when you pour out be very careful because the Quinoa can float, and some will escape when you pour the water out. Put in 1-1/2 cup water into the saucepan with the Quinoa and let it sit for 1/2 an hour. Soaking lets the Quinoa loosen up the outer coating of saponin, which can give a bitter taste if not removed. This is important because I've had bitter Quinoa before and I didn't care for it. When I did the soaking, I got Quinoa that was very similar tasting to rice and there was no bitter taste at all. Many of the recipes called for a 1/2 tsp of salt, but I didn't put any in, and it tasted just fine to me. If we go on the "cook it like rice" theme, the Asian way of cooking rice doesn't normally require salt, and I figure why add sodium if you don't need to. After the soaking, boil the Quinoa with lid on the saucepan at a medium low setting for 25 minutes. I put my stovetop heat setting at 3. Voila, you're done! Let cool down and serve as a side with any dish or as an ingredient in a dish like this Quinoa Pudding with fresh blueberries. As a variation, to add some flavor, you can replace the water with vegetable or chicken stock. You can add in a tbsp of butter and/or some of your favorite seasonings. Experiment and have fun!